Looking for deeper insight on markets? In tonight’s Closer sent to Bespoke Institutional clients, as equities rose once again today to finish January on a strong note, the S&P 500 finally closed in overbought territory (one standard deviation away from the 50-DMA) after not doing so for 79 trading days. We compare this instance to prior periods that the index became overbought after not having done so for an extended period of time also taking a look at the forward returns following these scenarios. 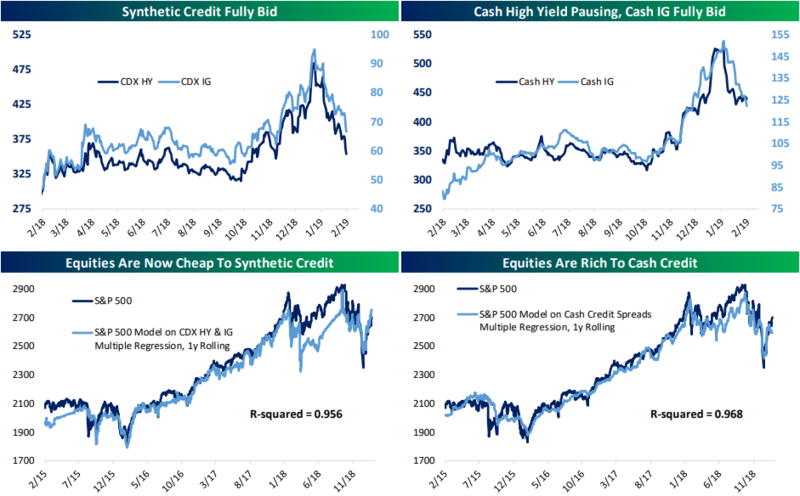 Next, we cover what synthetic credit has to say about the current fair value for equities. We follow that up with a look at mutual fund money flows using updated data from the ICI and what the S&P 500’s usual performance is given these types of flows. Turning to macroeconomic data, the BLS released the Q4 employment cost index data which we take an in-depth look at by industry and occupation. We finish tonight’s Closer with today’s strong reading in New Home Sales.